We’ve been busy at Mother.Domains, as we near the pivotal year of our business we founded over four years ago. Over the past year we’ve appeared at two major conferences in India, speaking both at DomainX, and at the national bloggers conference, BlogX. The 2019 India trip is in the works for February and March, as we slowly roll out Mother.Domains products and services across India. Hard at work in our Lab, we’ve been re-learning all sorts of new and next-gen programming languages. This list includes refreshing PHP 7.2, Solid, a lot of CLI (command line interface) installs, and even blockchain/holochain technologies. The time has to come to develop (our own) new things. We’re on the cusp of announcing our first major in-house product, Nomadic.Cloud – web hosting for digital nomads. Ahead of the launch, we’ve been looking out for digital nomads forums and communities, and other social networks in the digital nomads space. The latest Global Financial Crisis/Collapse is on the horizon. This will lead to an uptick in remote workers worldwide, and there will be a major, massive influx in new freelancers and digital nomads. The best way to get started is join a digital nomad community, see what it’s all about, and start meeting likeminded people. There’s a lot to learn, always, in this nomadic world. 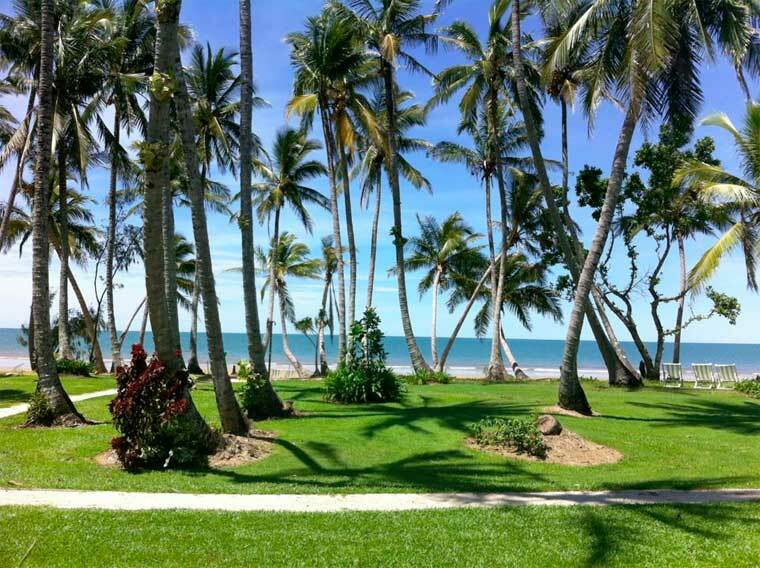 We take a look at some of the top digital nomads forums, and see what technology powers them. Of course, we have to start with the one with the strongest domain name for Digital Nomads Forums – https://digitalnomadsforum.com. Hosted on an old school phpbb installation, there are thousands of posts across over 6000 members. Forums include “Learn How to Be a Digital Nomad”, “Tools for Digital Nomads”, and information on taxes and currencies. NomadList is the king of the digital nomad social space, and have mastered the recurring revenue model completely. The site offers advanced insights into every digital nomad destination, with over 60,000 registered nomads. Their forums use a custom version of the excellent Discourse software, but you have to pay to be a part of Nomadlist. Nomadic Matt subtly integrates his site’s forums, in the midst of his great amount of resources for digital nomads. With dozens of categories, including geographical regions, Nomadic Matt’s forums are powered by the paid Invision forums software. NomadStack features a list of digital nomads communities and resources for the digital nomad. From the name, it has a tech focus, with a few Slack chat groups. A few top digital nomads Facebook groups to highlight include the Global Digital Nomad Network (around 35,000 members), Digital Nomad Entrepreneurs (38,000+), and Digital Nomad Booster (3700 members). You can often search for “digital nomads” and the city you’re in, to find a thriving local community. 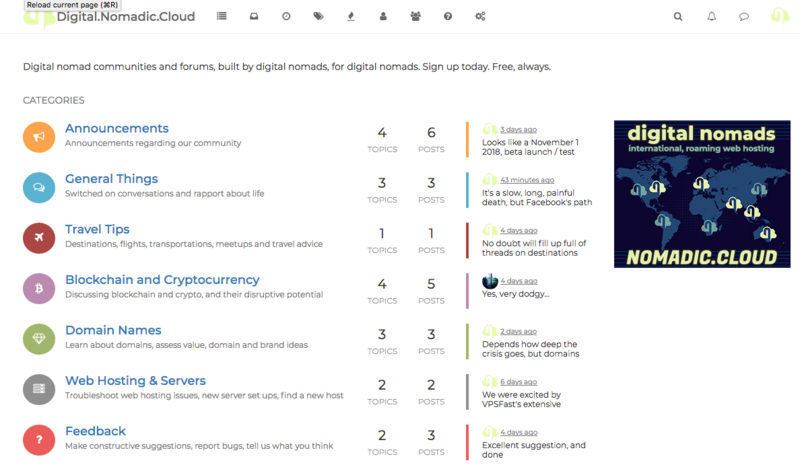 For one of the new upstart players in digital nomads forums and communities, check out Digital.Nomadic.Cloud. Powered by NodeBB, it is the inherent support and lifestyle community for the Nomadic.Cloud international hosting network for digital nomads. Stay tuned for the announcement and introductory offer for Nomadic.Cloud – rolling out around the world soon. Check out the awesome DigitalNomad.Blog, powered by Mother.Domains.